A VERY long time ago, I purchased pre-printed cat panels. They came 2 across the width of fabric so I got two identical panels. I also bought about 1 yard of a coordinating print. And then, both pieces proceeded to age in my stash. I can't even fathom WHEN I purchased the fabric, it was that long ago. But, there it remained in my yellow stash box. I'd flip by it everytime I looked through my yellow stash, reminding myself that 'yep, it's still there and I still don't know what to do with it." Seeing as there were *two* identical panels, I probably .. maybe? could have been? ... was thinking to make a throw pillow. Or maybe a pair of throw pillows. The only problem being that nothing in my bedroom in my parent's house, nothing in my very own apartment, nothing in the house I live in has yellow in it. As I flipped through my yellow stash, I once again came to the cat panels. This wild hair got into my bonnet and I pulled it out. Yep, it was *exactly* as I had bought it, lo those many years ago. But NOW, for whatever reason, I decided to make something with it. Obviously, it had aged enough and Its Time Had Arrived. Mr. Pirate has an adult niece. The niece is married to a really great guy and together they have an impishly cute little girl, Annika, who at this point is about 2 year old. I think. 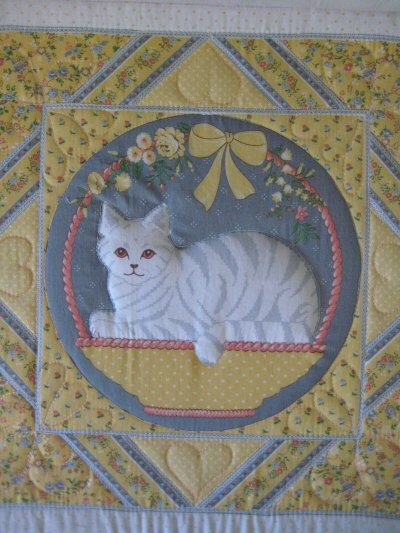 It seemed to me that the cat panels would make an impishly cute quilt for Annika ... and the design game was on. I fired up EQ (Electric Quilt) and started the design process. 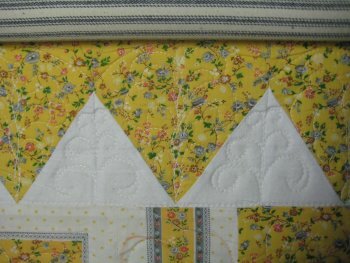 The basic layout was a ginormous 4-patch with some top & bottom borders to make the quilt big enough for a 2 year old. Now that fairly begs the question .. how big DOES a quilt need to be for a 2 year old? It's been exactly 19 years since a 2 year old lived in this house and my memory is somewhat fuzzy on that detail. :-) An aside: I also make quilts for a local crisis nursery and *their* minimum size for quilts for their 1 - 5 year olds is 36"x48". Therefore, I would use that as guidelines for Annika's quilt. 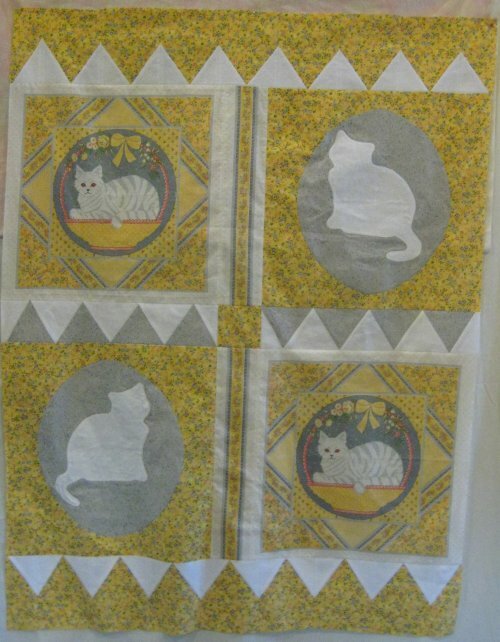 The cat panels were placed diagonally in the center 4-patch. That left something ELSE needed to be placed in the other diagonal spots. After thinking for a while, I decided that a white cat applique would be a good idea. 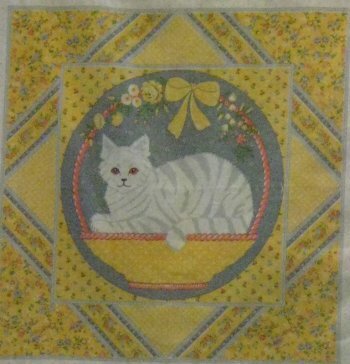 A white applique would coordinate nicely with the white cat on the pre-printed panel. It is only recently that I have come to enjoy doing applique. I've always loved the look, but the preparation for it is incredibly painstaking and troublesome. At least for me. There's the freezer paper template on the wrong side. That's great for needleturning the seam allowances under since the freezer paper provides a lovely crisp edge ... BUT .. you gotta get the freezer paper OUT before finishing the stitching. What a PAIN. Then there's the freezer paper (or removeable stickers) templates on top of the applique shape, using the edge of template as a guide for the needleturn. OMG .. I could never get that edge to look nice. What a PAIN. Oh, don't forget English paper piecing with newspaper .. same idea as the freezer paper on the wrong side and you *still* need to REMOVE the paper. What a PAIN. And for heaven's sake, let us not forget all the ways we can turn the seam allowances to the wrong side and secure them. NONE of them are quick and easy, all of them just take a whole lotta time to do. And I'm just NOT. INTO. ALL. THAT. PREP. That is the technique I used for the cat appliques. To do faux trapunto for applique, cut a piece of fluffy batting bigger than your applique piece. Place the batting on the wrong side of the applique *base* fabric. The order is : batting, base fabric, applique. Yes, that's right, the batting is on the *other* side of the base fabric. Fear not ... it all works out in the end. You can pin the batting in place or use spray adhesive. Then you machine stitch around the edge of your applique (or if you are machine stitching, the machine applique stitch is all that you need), securing the batting to the base fabric. Once the stitching is done, turn the fabric over and trim the excess batting away, close to the stitching line. What is left is batting ONLY in the applique shape. Now, do your quilt sandwich as normal: backing, batting, top ... only this time, your top will have that extra bit of batting in the applique areas, so when the sandwich is done, those areas will have TWO layers of batting. When the quilting is done, the applique areas will be nicely poofy. Leah Day explains how she does this process very nicely with words and pictures. The cat panel fabric also contained ribbon border stripes along the selvage edge. This meant that I had a very limited length .. exactly as long as the cat panel, in fact. I decided to use the ribbon border stripes as a vertical sashing between the two blocks. I now had (2) sets of two blocks sewn together with a vertical sashing. That left a horizontal sashing to be created between the top & bottom blocks. Originally, I was going to use a strip of the yellow print, but since I used that fabric as the background for the oval applique, using it again as a sashing would make it disappear. I had simultaneously been thinking of what to do to make the quilt longer and hence, more useable. I thought an ice cream cone border would look kinda cute and in thinking of that, realized that I could use equilateral triangles as the horizontal sashing! In fact, this arrangement is called a 'dogtooth' border. For whatever reason, I really like dogtooth triangles (i.e. equilateral triangles) better than sawtooth triangles (i.e. half square triangles). They just look "nicer" to me ... maybe because the appear to be balanced? Now the deal with sashings is that they obviously need to FIT THE SPACE. How the heck was I going to figure out what size those triangles needed to be to fit the 17-1/4" space of the cat blocks???? aaaaiiieeee! Do you remember that I'm all about easy? It turned out the solution was so simple, I didn't even need to use any math at all. To actually MAKE the pieced dogtooth sashing, I used the freezer paper strip as my template for ... freezer paper piecing! Freezer paper piecing has all the advantages of paper piecing with NONE of it's drawbacks. In fact, I have a great tutorial on the technique of freezer paper pieces on my quilting home page . The resultant pieced sashing exactly fit the space I needed. Each cat block got a dogtooth sashing beneath it and a contrasting square was put in the intersection of the sashings. But somewhere along the way, I got mixed up because I inadvertently placed one of the sawtooth triangle sashings upside down. I didn't realize it until I hung the completed 4-patch section up on my design wall. Oh, drats! Drats! Drats. Yep, I was certainly annoyed and even considered ripping it out to correct it. It said to *leave* it like that. It looked kinda cool. In this orientation, the white triangles were snuggled up against the white border of the cat panels and the gray triangles were against the block with the gray oval. The more I looked at it, the more it looked like a very interesting juxtaposition. So, it remains that way. I also need something on the top & bottom to make it a more useable length. I have always liked 'ice cream cone' borders (essentially a dogtooth strip with a scallop on top) but the one time I attempted it (in 2004 ... Aurora Pinwheels quilt) I failed miserably. :-) But for THIS quilt, I actually figured it out properly! I made myself a template of a single equilateral triangle with an extended to for the eventual scalloped top and used that to make my borders. I used a circle template to create the arc for the scallops and drew that line on the top before I quilted it. This drawn line was the *finished* edge, so I knew where my quilting needed to end. The secret about scallops is deceptively easy .... do NOT .. do NOT ... do NOT cut the scallops until EVERYTHING has been quilted and you are about to put on the binding! This quilt was quilted on Lizzie (my Tin Lizzie 18 longarm quilting machine) and when I loaded it, the scallops were NOT cut. The top & bottom raw edges were straight. While the quilt was still on Lizzie, I used a circle template to stitch along the drawn line. Let's talk about the quilting. 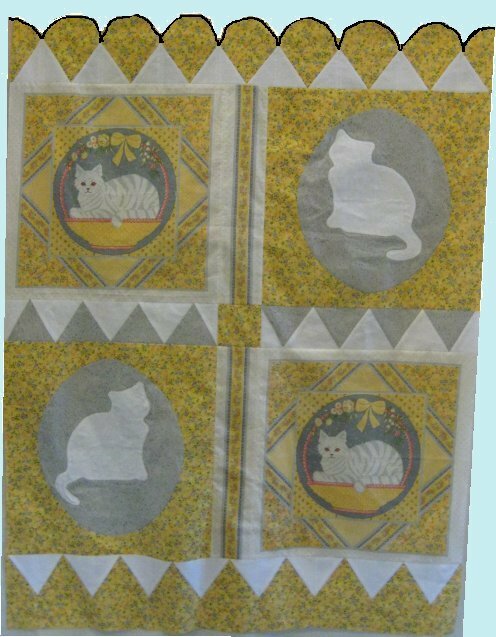 The printed cat panel was stitched in the ditch around all the major elements and hearts and a 3-lobed design were quilted in corners. 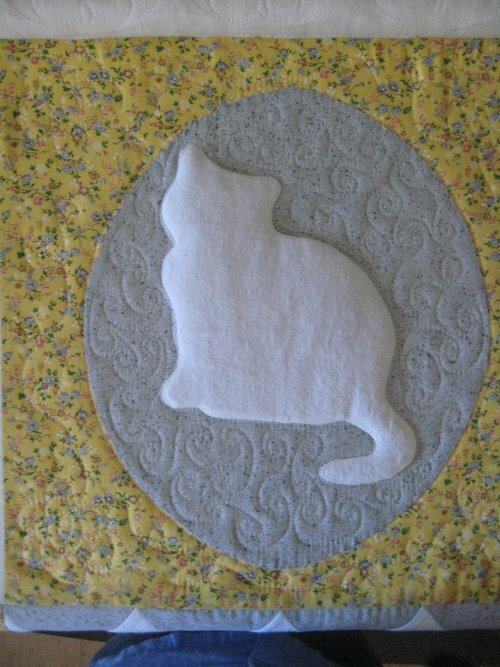 The trapunto cat was stitched in the ditch around its outline; the oval background was done with a swirly sort of design, as was the block background although a different swirly design. Having an all-over quilting pattern in the background allows the trapunto'd cat applique to puff up nicely. When the quilt was finished, I unloaded it and using my home sewing machine (Janome 6500), I sewed another line 1/4" outside the existing circular line in the outer border. This would be the cutting line for the scallops. Then, it was just a matter of making the double fold bias binding, trimming the seam allowances in the scallops and sewing the binding on. When I washed it, I was exceedingly pleased with the result.